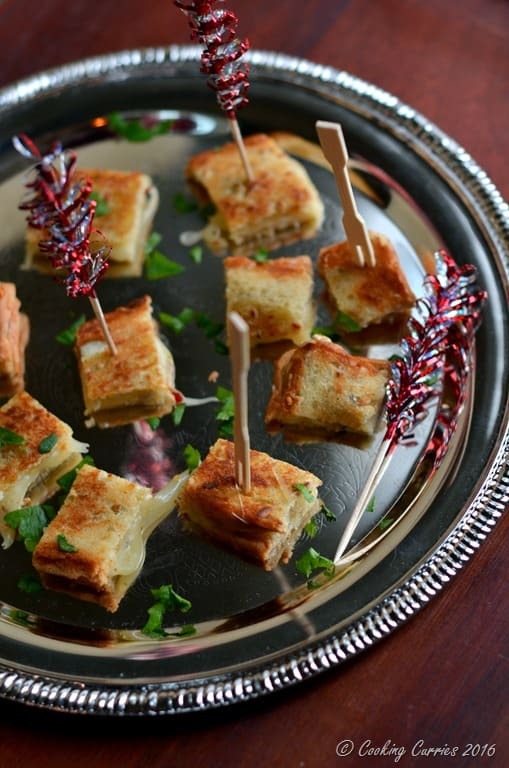 If you thought that a simple grilled cheese sandwich cannot be made any fancy, then you have gotta try this Truffle Grilled Cheese Sandwich Bites! 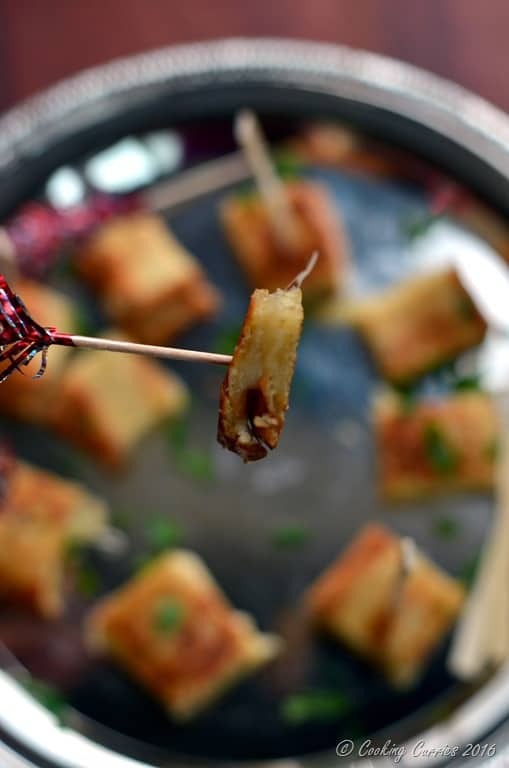 Serve it at your next party and your guests will be wowed! 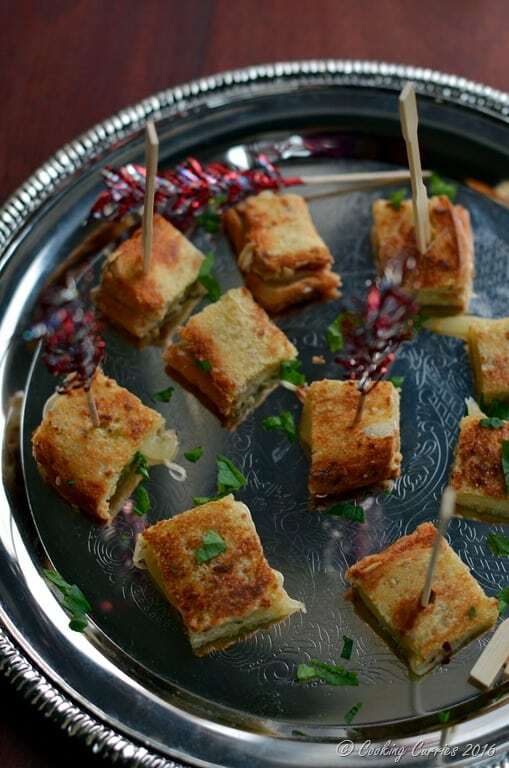 The inspiration to this party bites came from one episode in Gossip Girl, where Serena gorges on a Truffle Grilled Cheese Sandwich back in the kitchen of the Palace Hotel. The moment I heard the words Truffle and Grilled Cheese together I knew I had to make it. I love love truffle and have a tendency to try and use it wherever I can. Some have been good, some have been outright, “whoever thought of this crazy combo” kinda disasters. My favorites so far has been on this Truffle Rosemary Popcorn and this Truffle Polenta Crostini with Wild Mushroom Sauté – both excellent appetizers to give a fancy zing to your party. I used Truffle Butter and Truffle Infused Olive Oil to give layers of truffle flavor through out the sandwich. The cheese is pepper jack sprinkled with some chili flakes to give a little extra punch, as the truffle and cheese alone can get a little heavy and monotonous after a few bites. Hope you and your guest love this as much as we did! Cut off the crust of the bread slices or you can keep them as it is too. Melt one tbsp truffle butter in a pan. Place one slice of bread, top with one slice of cheese, a pinch of chili flakes and a few drops (about 1/2 tsp) of Truffle oil. Place the other slice of bread on top. Close with a lid and cook over low heat for a minute or so. Flip over and repeat on the other side, till the cheese melts. Before taking the sandwich out, drizzle the top of the sandwich with another 1/2 tsp of truffle oil. Repeat with other slice of bread to make three sandwiches. 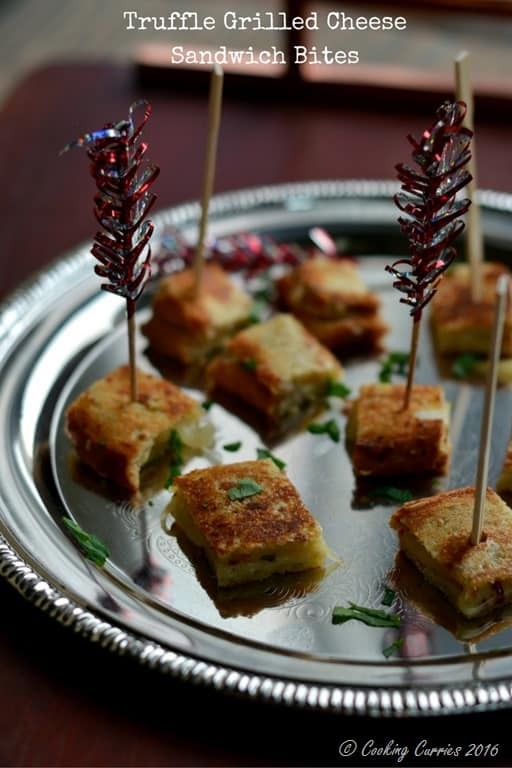 Cut into bite sized squares and serve immediately.